"Unapologetic" is how Felicia Lo always describes her obsession with color and craft. In Dyeing to Spin and Knit, Felicia, founder and creative director of SweetGeorgia Yarns and highly sought after teacher and lecturer, provides clear and accessible guidance for creating gorgeous hand-dyed yarns and spinning fibers and an understanding of how dyeing affects knitted yarn and handspun yarn. Fiber artists will learn the fundamentals of how color works, how to combine and coordinate colors, and how to control the results when dyeing wool and silk yarns and fibers. Spinners will learn how to subdue intense and bright colorways or prevent muddiness in handspun. Knitters will gain the knowledge to avoid or maximize the effects of pooling. And finally, this book will include 10 patterns that use hand-dyed and handspun yarns and fibers to their most exciting advantage in knitting projects. 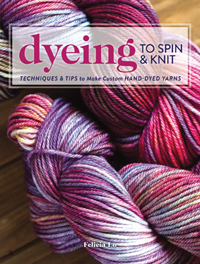 Complete with detailed photographs from Felicia's own dyeing studio, Dyeing to Spin and Knit offers a master class in preparing hand-dyed yarns and fibers. Ignite your love of color--unapologetically!